The second workout of the 2019 Reebok CrossFit Games Open was an almost repeat version of 16.2. Workout 19.2 featured toes-to-bars, double-unders, squat cleans, and an initial 8-minute time cap. Athletes were able to earn a 4-minute extension by completing the first two rounds in under 8 minutes and additional 4-minute extensions for completing each successive round before the new time cap expired. Each additional round contained heavier squat cleans but fewer reps. This workout was much more athlete-friendly than 16.2, which featured a pretty tight 4-minute initial time cap. The new format guaranteed all athletes at least an 8-minute workout, which feels much more substantial than having to stop at 4 minutes. The biggest strategy decision facing athletes on this workout was how to break up the toes-to-bars. Although the first 25 reps felt pretty good for most athletes, the second 25 were a different story. This workout required smaller sets in the first round in order to avoid big rests and singles in the second round. Unfortunately, many athletes realized this lesson too late. With more challenging movements, such as toes-to-bars and double-unders, as well as ever-increasing squat clean weights, we saw a lot more athletes choose the scaled version of the workout this week. 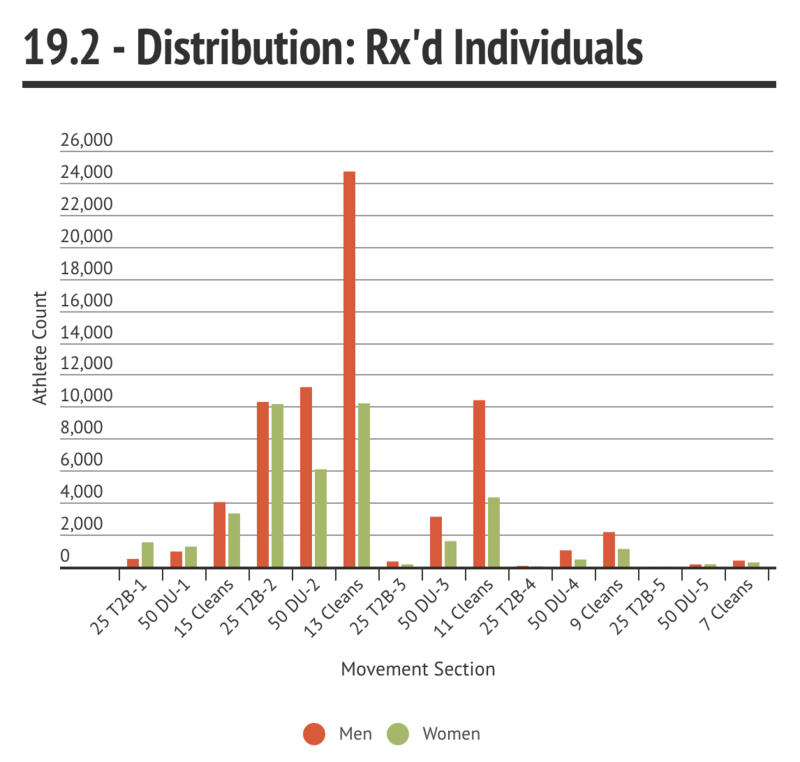 For men 18 to 34, 80 percent performed the Rx'd version this week, compared to 94 percent for 19.1. For women 18 to 34, we saw 57 percent perform the Rx'd version, compared to 83 percent last week. Similar trends held for the masters and teens. Looking at the histogram below, you can see a huge pile-up for men on the second round of squat cleans (185 lb.). Among the women, 54 percent finished the workout on some portion of round 2. Getting past the second round of squat cleans within the time cap put you in the top 25 percent of men and top 20 percent of women. When comparing 16.2 and 19.2, the extended initial time cap resulted in many more athletes making it past the first round. On 16.2, 30 percent of men and 45 percent of women didn't make it past round 1 within 4 minutes. For 19.2, by contrast, only 7 percent of men and 14 percent of women finished the initial 8 minutes in round 1. 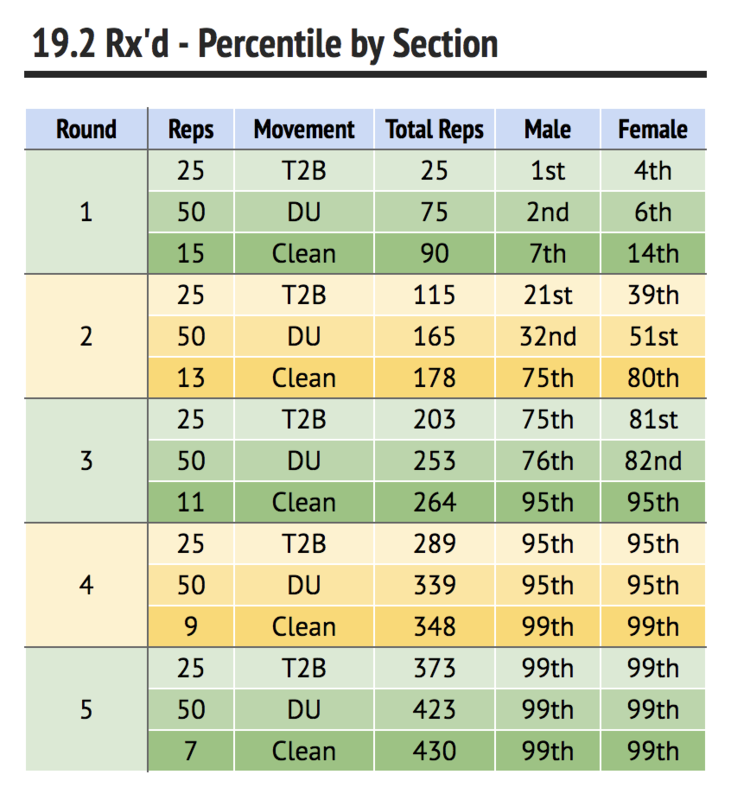 In the following graphic, you can see in which percentile range competitors landed based on which section they were working on when their workout ended. Getting through toes-to-bars and double-unders on a given round didn’t offer much of a bump in percentiles, but finishing an extra rep on the squat cleans could provide a substantial bump. Many competitors found themselves getting time-capped while chipping away at squat cleans. 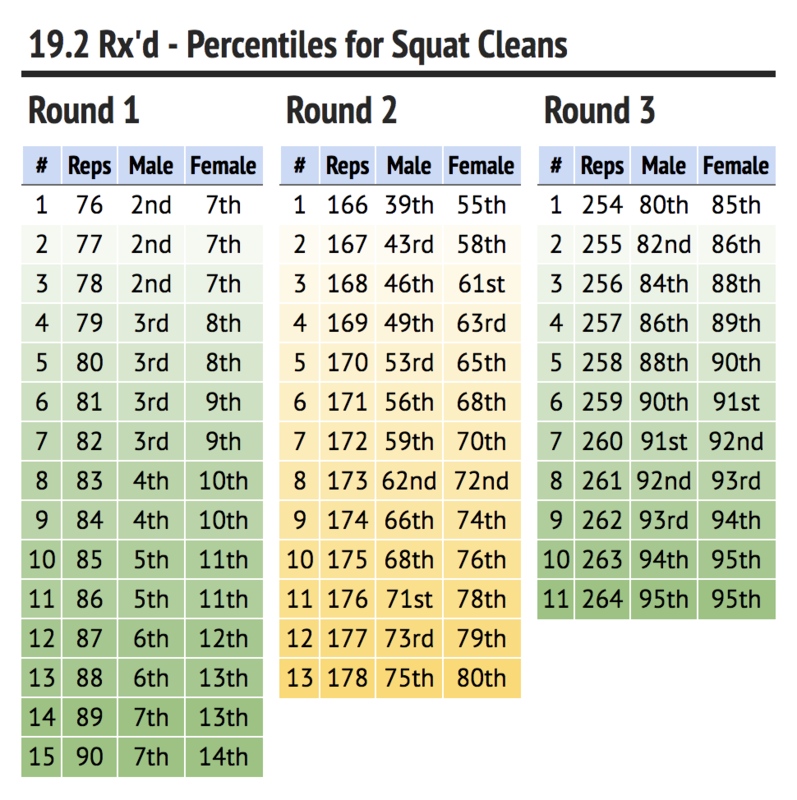 The following graphic shows what percentile was associated with each rep of squat cleans for rounds 1 to 3. For many of the rep ranges, an extra rep meant a 2-point bump in percentiles. 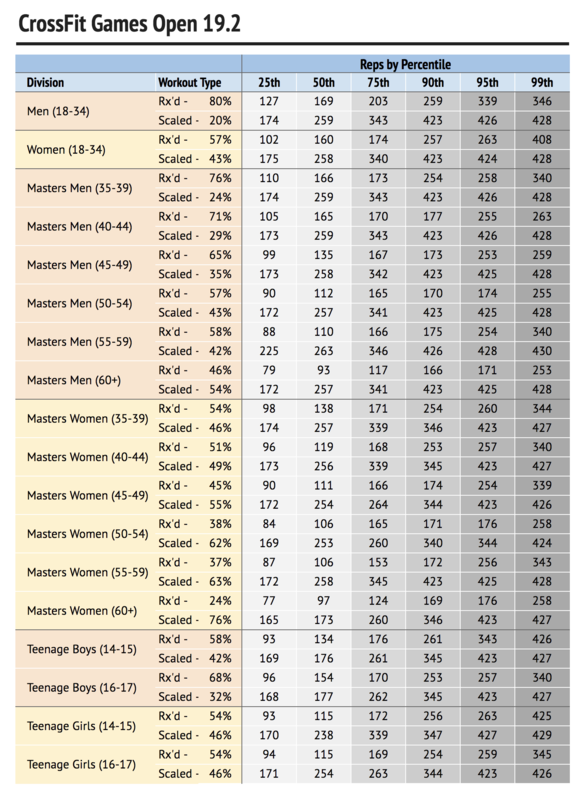 Below is the full percentile table for all divisions. You can see the breakdown of how many reps it took to achieve a particular percentile. For example, for Scaled Men 18-34, you needed a score of at least 343 reps to get into the 75th percentile. 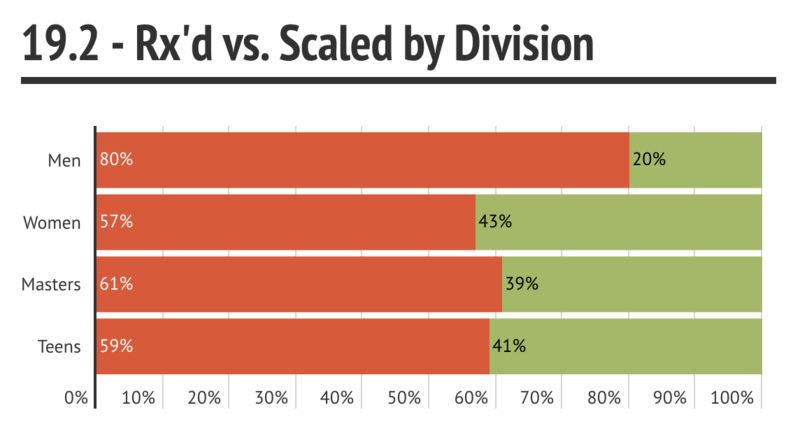 You can see the percentage of athletes who did the scaled version in each division as well.